Amlocim 5 mg: Tablets: Box of 30. Amlocim 10 mg: Tablets: Box of 30. 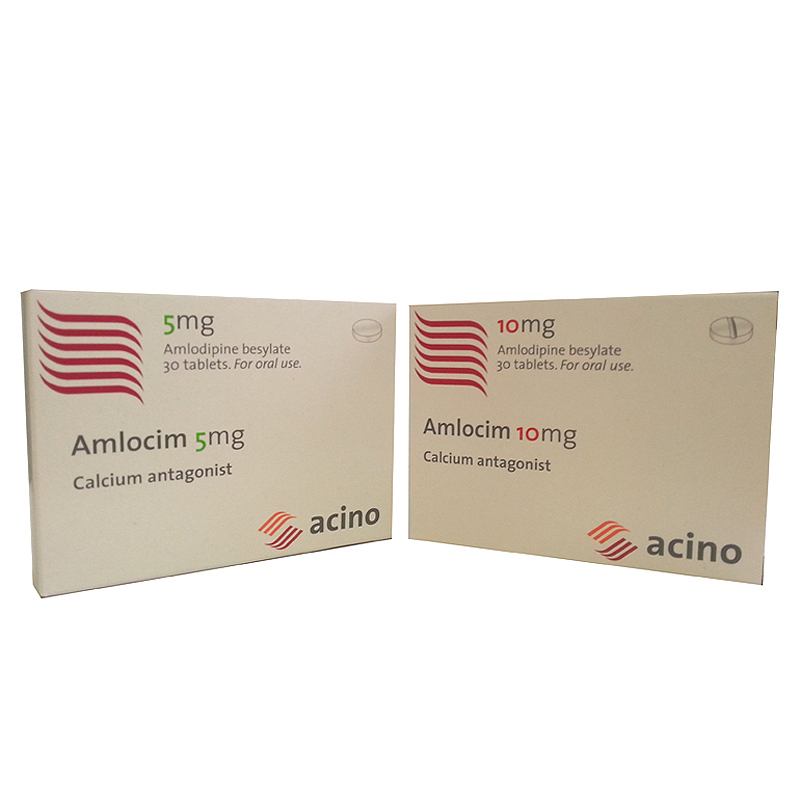 Amlocim 5 mg: Each tablet contains: Amlodipine: 5 mg. Excipients: povidone K 30, microcrystalline cellulose, calcium hydrogen-phosphate, crospovidone, magnesium stereate. Amlocim 10 mg: Each tablet contains: Amlodipine: 10 mg. Excipients: povidone K 30, microcrystalline cellulose, calcium hydrogen-phosphate, crospovidone, magnesium stereate. Amlocim, on its own or together with other antihypertensives can be used to lower high blood pressure. After taking a tablet the blood pressure will reduce gradually. Therefore there will not be any sudden or excessive drop in blood pressure. One tablet a day is enough to lower blood pressure in a 24 hour period. Amlocim, on its own or in use with other pharmaceuticals, can be used to cure the angina pectoris, caused by a reduction of oxygen in the cardiac muscle. A dose of one tablet a day of Amlocim increases the duration of the heart´s response to stress and diminishes the number of attacks of angina pectoris. Hypersensitivity to the active ingredient or one of its other ingredients or other dihydropyridine. Grapefruit juice contains one or two ingredients that can reduce the effect of some medication, including Amlocim. large quantities of grapefruit juice should be avoided with Amlocim (over 1 liter). In the case of small quantities (i.e.1 glass of 250 mL a day) it is improbable that these problems will occur. Caution is advised in patients suffering from liver or lungs diseases. Due to possible side effects, this medication can reduce a person´s reflexes, restricting his or her capability to drive a car or to operate heavy machinery. As a general rule, Amlocim should not be taken during pregnancy and breastfeeding. Often: headaches, vertigo, tiredness, drowsiness, nausea, abdominal pains, reddening of face, palpitations. Occasional: insomnia, changes in mood, tremors, change of taste, fainting, reduction in sensorial stimulation, tingling, blurred vision, tinnitus, very low blood pressure, dyspnoea, blocked or runny nose, vomiting, digestive disorders, changes in bowel habits, dryness of mouth, hair loss, change of skin colour, increase in perspiration, skin eruptions, itching, pains in the muscles, back and joint pains, muscle cramp, urinary disorders, frequency or nocturia, impotence, swelling of the mammary glands, weakness, pain, feeling unwell, increase or reduction in weight. Allergic reactions, severe blistering rash, sensitivity to light and swelling of the face, have also been observed occasionally. In these cases, the medication must be immediately stopped. Very rare: rigidity and muscle tension, joint and nerve disturbances, capillary inflammations, coughing, inflammation of the inner lining of the stomach, swelling of the gums, hepatitis, jaundice or problems in the pancreas. Take one tablet of Amlocim 5 once daily. The daily dosage can be increased to a maximum of 10 mg.
Amlocim should be stored at room temperature (15-25°C) and protected from light in its original packaging.